Yeah, yeah, yeah. I’ve had stuff to do. While this recipe is not difficult in the least, it does involve multiple phases. So while I was in the kitchen making madeleines I figured I’d add a tart to the mix. 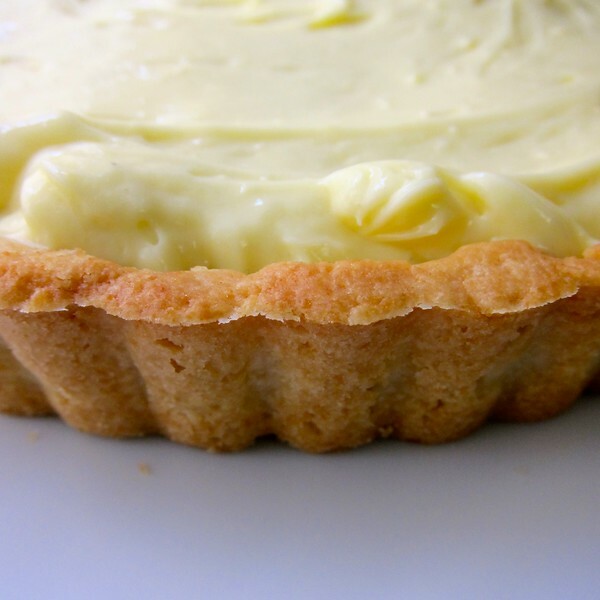 Pastry cream is a wonderful thing to have on hand. Endlessly useful and easy to make if you’re vigilant with a whisk. I found it useful to sing Taylor Swift’s Shake it Off while whisking away. Also, it might be a good idea to double the recipe. At least in my household, pastry cream has an odd way of disappearing. Sweet tart dough is also great to have on hand. You can make it ahead, press it into the tart pan and freeze tightly wrapped several days in advance. If you don’t mind a little danger in your life, it could also be frozen post-bar if wrapped carefully with the bottom metal disk still attached. Be sure to store it flat. Dorie asserts, and I agree, a darker golden crust is far superior to the anemic barely baked variety. I actually prefer mine bordering on burned. But, I realize I’m not the only one eating so coppertone tan is where its at. 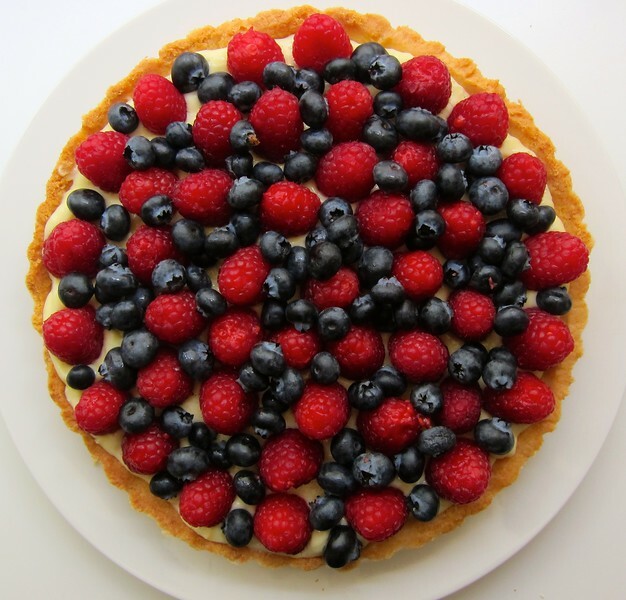 While I used berries for this tart, the possibilities are many depending on what looks good at the market. This would be a fantastic dessert for a dinner party. It looks fancy and can be made well in advance. 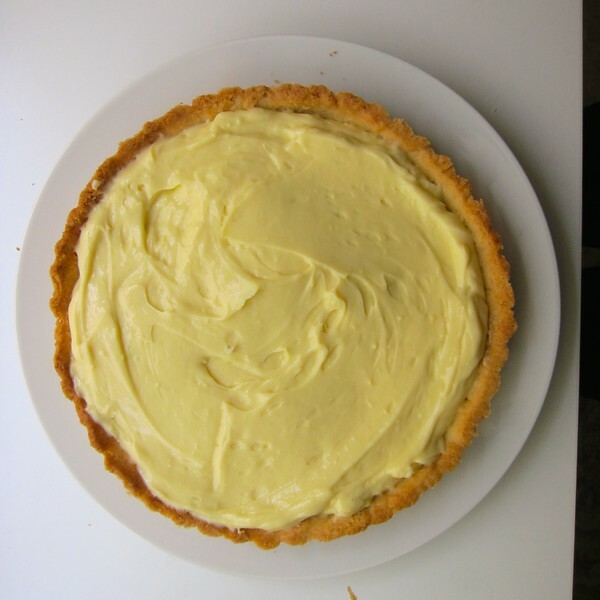 This recipe has three parts, the pastry cream, the tart shell and then assembly. 3 1/2 TBS unsalted butter, cut into bits, at room temp. In a smal saucepan, bring the milk to boil. Meanwhile, in a medium, heavy bottomed saucepan, whisk the yolks together with the sugar and cornstarch until thick and well blended. 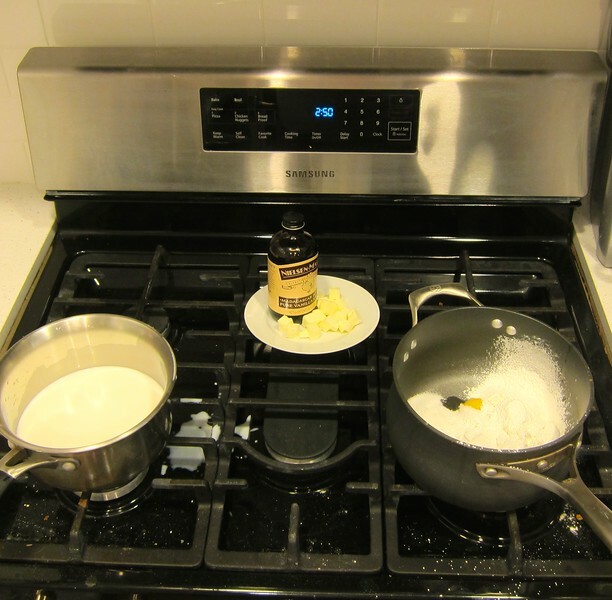 Once the milk is at a boil, remove from the heat and, while whisking the sugar mixture, drizzle-in about 1/4 cup of the hot milk to temper the eggs. Continuing to whisk, slowly pour in the remainder of the milk. Put the pan over medium eat and, while whisking continuously and vigorously, bring the mixture to a boil. Keep it at a boil while whisking for 1-2 minutes. Remove pan from heat. Whisk in the vanilla. Let sit for 5 minutes, then whisk in the bits of butter, stirring until they are fully incorporated and the pastry cream is smooth and silky. Scrape cream into the bowl, press a piece of plastic wrap against the surface of the cream to create an airtight seal. Refrigerate the cream until cold. In a food processor, add the confectioner’s sugar and salt. Pulse a couple of times to combine. Scatter the pieces of butter over the dry ingredients and pulse until the butter is coarsely cut in (you should have some pieces the size of oatmeal flakes and some the size of peas. In a small bowl, stir the yolk to break it up. Then, add to flour mixture a little at a time, processing in long, 10 second pulses in between each add until the dough forms clumps and curds. Turn the dough onto a work surface and very slightly knead the dough just to incorporate any stray dry ingredients. 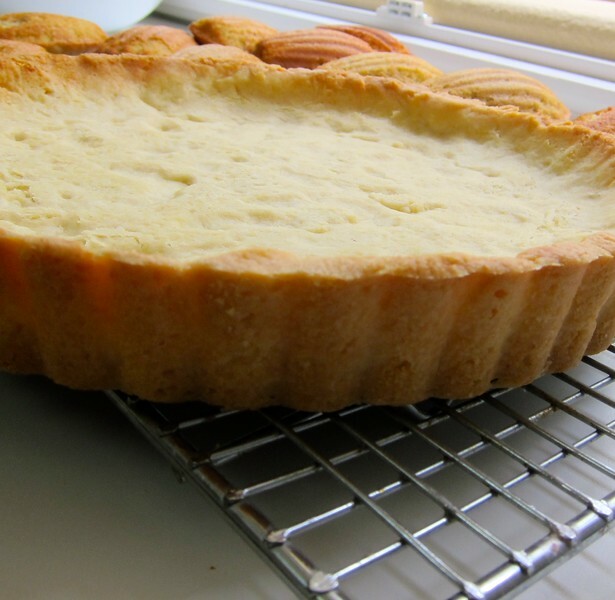 Butter a 9-inch fluted tart pan with a removable bottom. Press the dough evenly over the bottom and up the sides of the pan using all but a little piece of the dough (save to fix any cracks that form later). Freeze for at least 30 minutes. Can be wrapped tightly in plastic wrap and frozen a couple of days in advance. To bake, center rack in oven and preheat to 375 degrees. Butter the shiny side of a piece of aluminum foil and fit the foil, buttered side down tightly against the crust. Place the tart on a baking sheet and bake for 25 minutes. Carefully remove the foil. If the crust has puffed, press it down gently with the back of a spoon. Bake for another 8 minutes or until the shell is firm and a nice golden brown. 2 pints fresh berries, grapes, stone fruit, kiwis or just about any fruit that will not turn brown when cut. 1/2 C orange marmalade (the original calls for red currant but I like that the marmalade turns fairly transparent when melted. 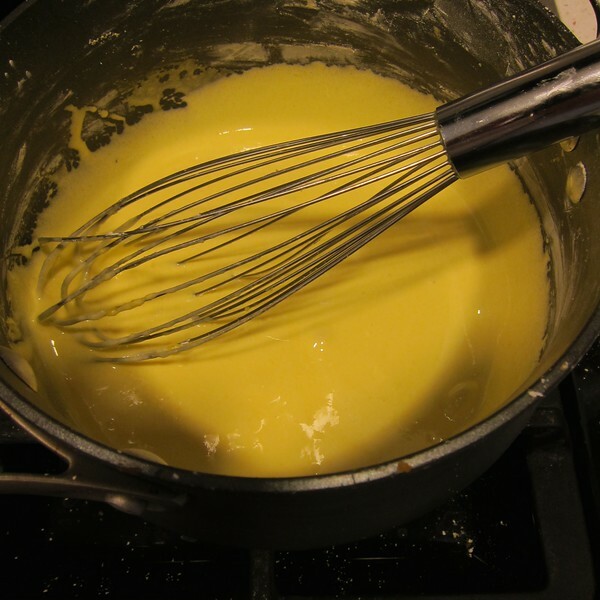 Smooth the pastry cream by whisking until smooth. Spoon enough of the pastry cream into the cooled shell to come to almost the top of the rim. Smooth using an off-set spatula. 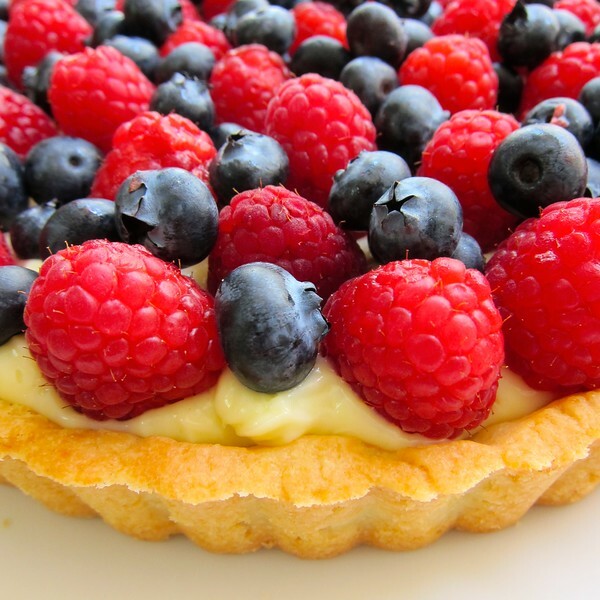 Lay the berries and/or other fruit on top of the cream in any desired pattern. Bring marmalade to boil with 1 tsp water. Using a pastry brush, gently glaze the surface of the fruit.